The Film of Her (1996) is a work of and about memories. (1) In the form of a first person voice-over, a former curator of the Library of Congress recollects his life and his work. He tells us of his enduring fascination with the cinema, his work in the copyright section of the Library, and his discovery and rescue of paper prints of films in the Library’s vaults. Having saved these images from destruction and oblivion, the clerk is promoted to curator. But as World War II breaks out, priorities are diverted from film preservation to archiving foreign films that have been seized from the enemy. The war being over, the curator, now “of no more use to them than these paper prints”, finds himself without a job. The collection’s significance receives belated official acknowledgement, but the clerk’s role in securing its survival goes unnoticed and, when an Oscar is awarded for its preservation, no mention is made of the man who discovered the prints. The predominance of documentary material in The Film of Her denotes that Bill Morrison’s twelve-minute short is based on real events. A second voice-over narrator provides some of the historical context from a third-person perspective. The production of paper prints served as a means of securing copyright for films prior to changes of copyright laws in 1912. While prints on paper were covered by copyright, moving images fixed on celluloid were not. The creation of paper prints presented a way of circumventing legislation. A copyright declaration and the paper print of the The Sneeze by Fred Ott, believed to have been the first item registered under the legislation in 1894 by Edison, as well as other items from the collection, features in The Film of Her. The clerk’s words on discovering the prints point to the historical significance of his find: “We had the first of everything in that vault […] the whole beginning of cinema.” Film history was to bear this out. The transitional period covered by the items in the collection add to its significance as testimony to the emergence of conventions of filmic representation. Morrison’s twelve-minute flashback on the clerk’s life advances in metonymic leaps of imagery. Thus, shots of farewells, stations, suitcases and rail-tracks condense the moments when the clerk takes up and leaves employment at the Library of Congress. The voice-overs provide two different vantage points on to the imagery: the clerk’s reminiscences are personal and emotionally charged, the third-person narration contextualises or introduces his statements, elicits the thematic significance of the imagery and tells of the clerk’s fascination with “Her”. Picking up issues from each other, these commentaries co-operate in gathering the imagery into a narrative fold. This narrative structure is wrought from highly diverse sources. The Film of Her is yet another contribution by Morrison to found-footage films, a strand of filmmaking which recycles and reassembles footage that has been retrieved from a variety of storage facilities and sources. 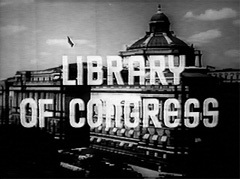 In The Film of Her, documentary material about the Library of Congress combines with out-takes from fictional material and iconic examples of early footage from the paper-print collections, such as Muybridgean studies of a monkey’s walk and a bird in flight, as well as segments from industry films or anthropological studies. Morrison welds this heterogeneous material into a story and, in making fragments from “thousands upon thousands of paper rolls” the subject of his film, he also provides a rationale for the inclusion of extremely diverse images in the film’s diegetic world. The Film of Her also displays considerable stylistic coherence. Where the recycled footage was originally in colour or carried sound, this is suppressed in The Film of Her. A high instance of superimpositions in the transition between shots makes these seem to emerge out of each other. Rapidly edited sequences in which movement within or mobility of the frame connects shots underscore the sense of an almost inevitable rhythmic flow this creates. This sense of rhythm is highlighted by the difference in speed in which some of the footage is shown and by the music that accompanies The Film of Her throughout. A ponderous piece in bright tonal colours by Bill Frisell opens the film. As the doors swing open on the vault which houses the paper-print collection, a solemn work by Henryk Gorecki, which slowly evolves in rich clusters of sound, replaces this. Both pieces respond to the imagery that accompanies them and they are frequently rhythmically aligned with it. Frisells’ permutational music resonates with the repetitious processes of industrial production shown in the film’s first half. The title of Gorecki’s work, Pieces in the Olden Style III, well conveys the melancholic and nostalgic atmosphere of the film’s second half, in which the clerk looks back at his life and at a central achievement which has been forgotten in the official version of how the paper-print collection came to survive. However, the clerk’s story only makes up some six minutes of the The Film of Her. The remaining time is taken up with a framing device and filmic preamble that inflects the film’s meaning. It is preceded by an opening sequence that returns with conspicuous variations at the end of the film. The film begins with the shot of a hand that takes a roll of film off a shelf. This is followed by the image of a sleeping man who is slumped over a table as a cloaked ghost-like figure, a figment of his dreams, it seems, approaches. Then we see a candle, placed in an early projection mechanism on which the lens is being closed. In the film’s final shots, the roll of film is returned to one of the numerous shelves that are shown in a travelling shot, a circle of dancing ghosts fading away as the dreamer awakens. A section of celluloid runs its course through the projector, the lens is opened and the candle is extinguished. This opening scene seems to announce what James Peterson summarises as the “style-as-consciousness heuristic” and, thus, a central device in American avant-garde film. (5) Here, a mediating character is introduced in the early portions of a film to mark the operation of style as representation of human consciousness. The Film of Her advances at a rapid and, at times, mesmerising pace of editing; however, familiar patterns of narrative and narration are readily evident. Morrison’s early introduction of a dreamer does not motivate stylistic idiosyncrasies that suggest the workings of the mind. Rather, this opening sequence juxtaposes the realms of human consciousness, and that of cinema as an external facility for capturing and storing traces of the real. This analogy pervades and sustains Morrison’s film. As it pursues its themes of private and collective recollections, and their preservation, this analogy comes to focus on memory, its externalisation and the photographic trace. The theme of an externalised memory runs through Morrison’s film. Pride of place in the exploration of this is reserved for the medium in its most physical sense. Following the framing sequence and a highly condensed summary of creation and the beginnings of life, a rapidly edited montage sequence, which takes up almost two minutes of the film, portrays the manufacture of celluloid. 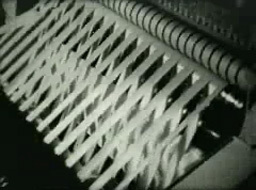 After the film’s title shot has appeared, a similar sequence shows the production of paper from the felling of trees to the printing of rolls of images. This transition between memory stored and memory appropriated provides a rich seam of imagery and commentary in The Film of Her. Visual memories are unlocked when the doors of the vault that houses the forgotten paper prints are opened. References to the activities of indexing and cross-referencing denote the cognitive pathways along which the stored knowledge is organised to create an interface for its reappropriation. Images once “frozen” are ready to undergo a transformation as they are “brought back to life” and then “wait on a shelf” to “be born again” or “resurrected”. If the description of this transformation in The Film of Her draws heavily on the language of natural creation and revival, it is shown to be subject to the forces of historical and social change. The outbreak of World War II impacts on preservation and indexing. In compliance with legal decree, books are burnt to make space for new items. As piles of books are consumed by flames, the capacity of these storage facilities to foster oblivion as well as remembrance are made conspicuous. Historical associations of the burning of books reverberate in these shots, and throw the value judgments and gate-keeping function behind such processes of selection into sharp relief. When upon his discovery of the prints the clerk is promoted to curator, the value attributed to the archival items translates into hierarchy of a social nature. In The Film of Her, archival items, never registered or recorded, submerged under the sheer volume of information, are shown to be subject to a dynamics of storage and loss of externalised knowledge which evokes notions of memory. This dynamic is not unique to the photographic image and the film repeatedly features images of books on endless rows of shelves or scripts some of which were, as the voice-over informs us, never properly recorded. Morrison repeatedly invokes the concept of evolution to highlight that photographic reproduction merely indicates a stage in the process of externalisation of memory: the two similarly metonymic sequences of industrial-scale production of perforated strips of celluloid and rolls of paper prints evolve seamlessly out of a condensed account of natural creation, from stars circling through the universe to the partition of cells and the image of a baby. The clerk’s claim that in rediscovering the paper prints he has found “the whole beginning of cinema” is accompanied by an iris shot of an eye that establishes a trajectory from human to technologically mediated perception. The third-person narrator makes reference to paper prints as “fossils of an extinct species”, as we see an elephant collapsing under the impact of an explosion. The film’s very concern with photography as “frozen” moments in time which will be “brought back to life” by pictures that move, in itself encapsulates a moment of transition in the evolution of media and the film highlights this as it shows the process whereby the still images of the collection are re-animated by being individually re-photographed. In this concise history of media, Morrison clearly marks the moment from which photography and film emerge: emblems of modernity rush past us as images of technology and mass production, of raw materials being processed into paper rolls and celluloid follow upon each other. If Morrison denotes the historical moment out of which the photographic image arose, he also explores its specific relation to the past. As Ruchatz points out, the notion of the “trace” as the “result” rather than a “representation” of the past captures a central feature that memory and the photographic image have in common. (9) The clerk’s fascination with restoring the prints is driven by precisely this quality. The film’s central theme of his fascination with “Her”, his quest to bring back time and revive “Her” now long faded beauty, is redolent of a “cinephilia” that is grounded in the medium’s ability to revive the past through the resurrection of its photographic trace. As Morrison engages with the ruins of representation that are the paper prints, his film pays homage to photographic images as Footprints, to quote the title of his 1992 found-footage meditation on memory, evolution and film. 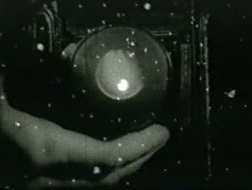 The very first words of The Film of Her accompany a series of shots that raise the question of the relationship between the trace and the past which it records. The clerk commences his narration with the words: “It’s like the old philosophical question. If a tree falls and there is nobody there to hear it, does it really make a sound?” Multiple images of falling trees and a trunk that sways from the impact of the felling blow accompany the question. Is reality contingent on our perception of it, be it human or technologically mediated, as in the pictures that accompany the question and, inversely, does such perception or recording vouchsafe for “the real”? The question has clear resonance with the film’s theme of the rediscovered paper prints and the link they are meant to establish to past and, indeed, almost lost time. However, the fate of the paper prints also sensitises the viewer to the perennial mutability of what they record. Consigned to a vault to “wait for an eternity”, the prints’ significance has been crucially redefined. As the voice-over explains: “They are paper prints. They were never meant to be projected at all. They are only proofs that they exist at all.” Far from merely testifying to their own existence, they assume the status of “missing links” to “past times” upon their rediscovery. The Film of Her raises the issue of the mutability of the photographic trace by the very process of its making: when the voice-over describes the items in the paper-print collection as “links to past time”, this serve no less as a description of the material of which it is made. This story of personal recollection is also based on “re-collection” in a literal sense. 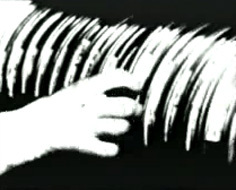 The film’s opening shot of a disembodied hand selecting a roll of film makes striking reference to this. The gesture also reveals that The Film of Her is based on cinematic ready-mades, and thus on a trace of the past that will now becomes subject to re-representation and re-inscription. As William Wees notes, all found footage filmmaking is based on a process whereby images are invested with new meaning. While the degree of and the critical impetus behind this appropriation of meaning might vary, found footage at the very least bears its mark by inviting “us to recognize it as found footage, as recycled images” (10). The Film of Her proffers ready evidence that meaning has been reinscribed. The unified stylistic surface of the film, the requisitioning of images from a visible variety of sources for the creation of narrative cohesion are the circular structure into which this is embedded are salient reminders of this process, as is the visualisation of the clerk’s “philosophical question”. This comes with an audible twist: it is mute. While the repeated portrayal of falling trees forcefully cues us to complement the picture with a sound, we are ultimately left to infer this; the question of how this image relates to what it records remains conspicuously unsettled. With this, any notion that the photographic traces which make up The Film of Her might be transparent onto the past is undermined at an early stage in the film. “Traces”, as Ruchatz notes, “are far from being innocent remains of the past”, rather they “are generated – in the sense of a constitutive posteriority – reflecting the interests and procedures of the present which interprets them” (11). This is perhaps most conspicuous in two-shot sequences which recall Georges Méliès’ weaving of magic by means of film and editing. In the first of these, a woman is undressed by mere conjuring and turned into a painting. In what seems like an ironic aside, this magic transformation is accompanied by a reference to the paper prints “as proofs that they exist at all”. When the same motif returns later in the film, the woman emerges literally out of a roll of paper and is dressed by the mere gesture of a magician’s hand – this time to the similarly incongruous reference to a “victory over seemingly impossible odds” for which the recipient of the Oscar is credited. If at the time of their making these images would have drawn on their audience’s fascination with a life-like representation of the impossible, they now seem like charming and semi-comical relicts of ways of seeing. We literally see something different in them. Amongst the footage that makes up The Film of Her are segments from a short by Kemp Niver which illustrates the Renovare process he developed to transfer the paper prints on to 16mm acetate safety stock. The title of this film, Reclaiming American History from Paper Rolls by the Renovare Process, reflects a considerable ambition in the encounter with these relics of past time. Morrison’s account is strikingly different. Far from “reclaiming history”, his film uses the paper prints as material and thematic point of departure for an investigation into the dynamics of remembering and the ever-mutable past this produces. The Film of Her can be viewed on: desires.com/features/thefilmofher/her_video_five.html (last consulted on 18/08/2006). Gabriel M. Paletz, “Archives and Archivists Remade: The Paper Print Collection and The Film of Her”, Moving Image, Vol. 1, Spring 2001, p. 71. Note the discrepancy between these dates, given by Morrison, and the actual dates, which were 1942 for the rediscovery of the prints and 1955 for the award of an Oscar to Niver (cf. Paletz, 2001). Bill Morrison, “The Film of Her”. James Peterson, Dreams of Chaos, Visions of Order. Understanding the American Avant-Garde Cinema (Detroit: Wayne State University Press, 1994), p. 40. Jens Ruchatz, “Fotografische Gedächtnisse”, in Astrid Erll and Ansgar Nünning (Eds), Medien des kollektiven Gedächtnisses. Historizität – Konstruktivität – Kulturspezifität (Berlin: Walter de Gruyter, 2004), p. 86. Translation by the author. Astrid Erll, “Medium des kollektiven Gedächtnisses: ein (erinnerungs-)kulturwissenschaftlicher Kompaktbegriff”, in Erll and Nünning (Eds), p. 4. Translation by the author. Aleida Assmann, “Zur Mediengeschichte des kulturellen Gedächtnisses”, in Erll and Nünning, p. 48. Translation by the author. Ruchatz, p. 89. Translation by the author. William C. Wees, Recycled Images. The Art and Politics of Found Footage Films (New York: Anthology Film Archives, 1993), p. 11. Ruchatz, p. 90. Translation by the author. Mary Ann Doane, The Emergence of Cinematic Time: Modernity, Contingency, the Archive (Cambridge: Harvard University Press, 2002), p. 223.